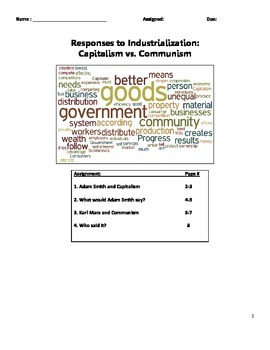 Resource packet includes four assignments that have students explore the major beliefs of capitalism and communism. In the first assignment, students read excerpts from the Wealth of Nations about self-interest and supply and demand. Difficult words are defined for struggling readers and sources have scaffolded questions next to them. 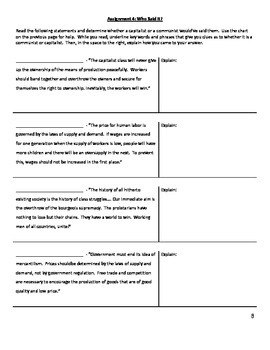 The second assignment has students respond to various scenarios as if they were Adam Smith. 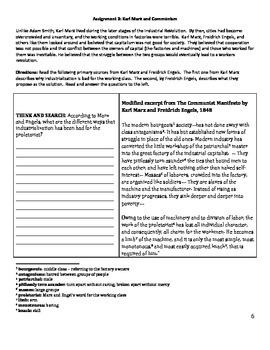 The third assignment has students read excerpts from the Communist Manifesto and the Principles of Communism with difficult word defined for struggling readers and scaffolded questions. Finally, the last assignment has students read four excerpts from either Adam Smith or Karl Marx and have to identify who the speaker is and explain why. 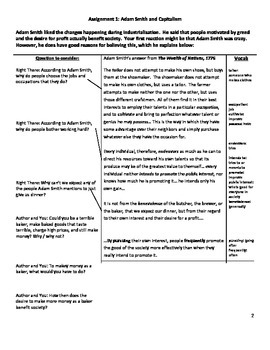 The last assignment comes with a resource chart that reviews the major differences between the two economic systems.